It’s not often that Jazz Hastings gets the chance to feature a brilliant musician who appeared at the legendary Woodstock Festival in 1969. 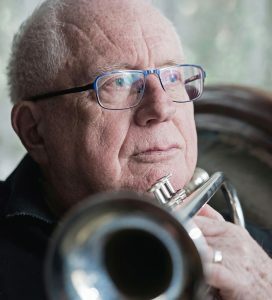 But that’s exactly what will happen when we host veteran trumpeter Henry Lowther and his long established band Still Waters at our next session on 9 April, says Julian Norridge. Henry Lowther was born in Leicester in 1941. Having started playing the cornet in the local Salvation Army band, in his teenage years he developed an interest in classical music and studied violin, eventually entering the Royal Academy of Music at the age of 18. Soon afterwards, he became interested in jazz and, inspired by a Sonny Rollins recording, returned to brass playing, taking up the trumpet. In the ‘60s, he split his time between jazz and the rock scene. 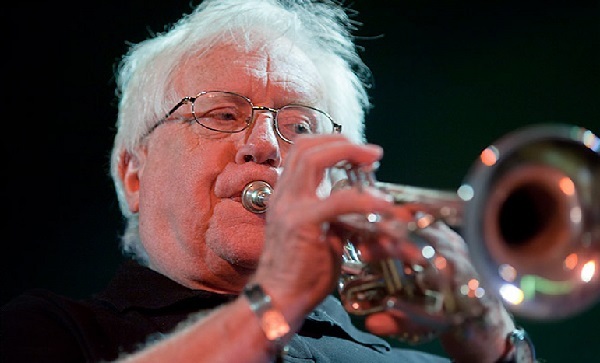 In 1967 he first played with the John Dankworth Orchestra, beginning a relationship that would last for 45 years. But he also played with bands like Manfred Mann, John Mayall’s Bluesbreakers and the Cream bassist Jack Bruce. That famous session he played at Woodstock was with the Keef Hartley Band. But in later years he concentrated more and more on jazz, playing with most of the great players of the era. Henry formed Still Waters in 1996 along with his friend of 40 years, bassist Dave Green. It is now one of the most accomplished and creative bands around, playing radical and original music, ranging from gentle, quietly pastoral and melodic compositions, reflecting the band’s name, through to dynamic improvisation. Henry Lowther’s musical breadth is confirmed by his frequent appearances as a classical player with major symphony orchestras and ensembles. As a session musician, he has recorded with Bing Crosby, George Harrison, Elton John, Paul McCartney, Van Morrison, Sir Simon Rattle and Nelson Riddle, a pretty eclectic mix. Along with Dave Green on bass, Henry will be joined at Jazz Hastings by Pete Hurt on saxophone, Barry Green on piano and Paul Clarvis on drums. Henry Lowther and Still Waters Jazz Hastings, Tuesday 9 april, East Hastings Sea Angling Association (on the Stade behind the lifeboat station). Doors open 7.45pm for 8.30 start, tickets £10 on the door.